King Roo needs a new treasurer, and what better application form than a Sud... I mean, Roodoku puzzle? 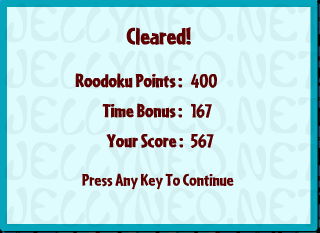 Roodoku is a great test of logic and quick thinking to solve 'simple' puzzles. It may be a good idea when you're starting out to play the practice round so you can get a feel for the rules and controls. Of course, in the practice round, you get no Neopoints, but it'll help you work out some strategy. Plus, it's only made up of 2x2 boxes, so it's a far easier puzzle to start out on. So let's get started, shall we? Each column must contain the numbers 1-9. Each 3x3 box must contain the numbers 1-9. Step 1: The box already contains every number but 5 and 8. Therefore, 5 and 8 must be used to fill the two empty spaces. Step 2: There is a five in the same column as one of the empty spaces. Therefore, another 5 may not be placed in that column. The 8 must be placed there instead. Step 3: There is now only one available number for the last empty box. The 5 must fill the box. Above, you'll see the game screen. To the right, you'll see a timer telling you how many seconds you have left before the time bonus runs out, as well as a count of how many more squares you have to fill. As for the puzzle itself, to input a number, mouse-over the square you'd like to fill, and a tiny 3x3 box will appear inside it. Move your mouse to the number you wish to input (1,2,3 on the top row; 4,5,6 in the middle, etc.). You'll see all the other instances of that number highlighted so you can make sure you're not doubling up on numbers. Simply click the number to add it. If you wish to delete a number already entered, mouse-over one of the dark blue squares (the one's you've filled--you can't change the starting numbers), and select the little eraser to the side of the square. Now, you're probably thinking, that seems a lot easier said than done. And you're probably right. There are a lot of strategies to develop when solving Roodoku puzzles, especially the hardest ones. There will be a few basic clues here, but you're encouraged to develop your own as you gain experience solving these puzzles. Perhaps the best way to get a hang of the basics is to solve one of these together. To that end, let's take a look at a sample puzzle from the "Medium" difficulty category. Sometimes the toughest part is finding where to start. Here, it's pretty simple. See that bottom-middle box? There's only one missing space. Whenever there's only one missing space in a row, column, or box, you automatically know what number needs to fill that space--it's simply whichever number is not included currently. In this case, that's a 5. Next, you may notice that the middle-left box is missing only two numbers. This is also a good sign. You need only one piece of evidence to solve the rest of this box--you need one of the two needed numbers to appear in one of the rows or columns containing the empty boxes. If we examine this box, we'll find that we get our wish--the box needs a 2 and a 3. The third column contains a 2, so we can place the 3 in the rightmost empty box and the 2 in the other. Let's take a look at box AZ. Since the other two empty squares in that box are part of a row containing a 3, AZ must be the 3 for that box. Since the A column contains a 6, the 6 must go in box BY, and AY must be an 8. Now that we've filled BY, we can fill BS and BT. Since the S row contains a 3, the 3 must be placed in BT. That leaves BS to be an 8. Because of the 1 in HS, HY cannot be a 1. GY must then be a 1, and HY a 9. The X row is filled except for this square, so we know what number it contains--a 3. The 4 in GW means the 4 in the bottom-right box must be in HZ, leaving GZ to be a 2. The F column contains a 7 and an 8. Since the W row needs a 2, 7, and 8, FW must be a 2. IY's 7 precludes a 7 in IW, so IW is the 8 and DW the 7. Now, let's look at a mid-level strategy. For this, we look at which columns, rows, and boxes have already been claimed by a certain number in hopes that we can place that number in one of our empty squares. Take a look at the 7's in the right-most boxes. The top box and left column are claimed by the 7 in GT, and the bottom box and right column are claimed by the 7 in IY. This means that we require a 7 in the middle column of the middle box. HW is already claimed, and the V row has a 7. Thus, the 7 must go in HU. The V row also contains a 2, so the 2 necessary for the column you've just added to must go in HT. This leaves HV to be a 5. Let's use the same strategy to place the third 2 in the middle set of boxes. The left box claims the middle row, and the middle box claims the bottom row. GZ's 2 eliminates GU as a potential 2, so the 2 must go in the IU box. This then allows a 1 to be placed in IW. To finish out the I column, note the 4 in DS. IT must then be the 4, making IS a 5. The R row is claimed by the 5 in FR, and the S row is claimed by IS. The final 5 in the top boxes must then go in AT. AS then must be a 7. We now have two of the top three 7's claimed, so the final 7 must be in the top row of the middle box. We then discover that it must go in ER. We then can place the 2 and 9 in the S row, along with the 1 and 4 in the R row. This then leaves CT open to another 1. The E column can be filled its 6 and 8, providing the opportunity to fill the T row with its 8 and 9. We then complete the F column with its 1 and 6. The remaining four boxes require two 3's and two 9's. Since each vertical pair is in a single column, and each horizontal pair is in a single row, it actually doesn't matter which number you put where, so long as you reverse them for the other pair (i.e., 3-9 in the first column and 9-3 in the second, or 9-3 in the first and 3-9 in the second). There are many other techniques you will start to develop over time, for this is one of those puzzle styles that is very true to the idea that practice is the best tutor. Here are a couple of things to try if you get stuck: copy the puzzle onto paper and write in the possibilities for each square. You can then compare squares, trying to find ones with a single possibility and using those to eliminate possibilities in other squares. As you practice, you'll start to be able to do this in your head. Three or four empty spaces seems to be the limit of easy mental reasoning after practice--five takes a bit more talking-through-it sort of effort, and 6 is very tough to do entirely in your head. Fortunately you won't need more than about 4 at once most of the time. If you didn't catch the joke at the beginning of the guide, Roodoku is named after Sudoku, a magic-square puzzle developed in France and America but popularized in Japan. 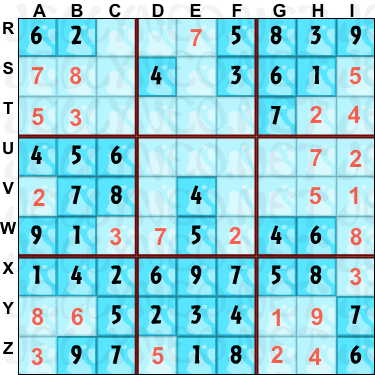 Because of its popularity, there are many websites, books, and other resources that have great tips for Sudoku puzzles. The more you practice and develop the strategies, the faster you'll be. The faster you are, the greater bonus, the higher score, and the more Neopoints. Easy is worth 200 points, Medium 400 points, and Hard 600. In addition, you get 1 point for each second left on the time bonus counter. However, there are two important differences between Roodoku and Sudoku that will affect your strategy: the time bonus and possible multiple solutions. 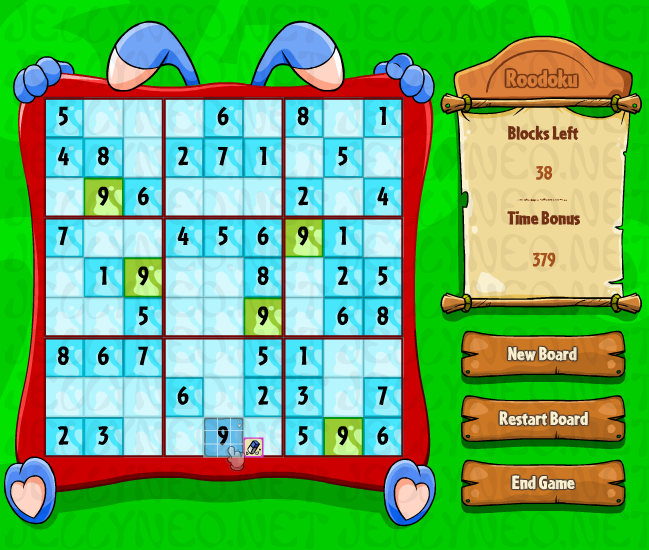 First, Roodoku's time bonus means you may want to spend less time puzzling out a solution, as you would with a Sudoku. You might instead opt to make occasional guesses, risking a spoiled board for the chance of earning more Neopoints. You may even choose to throw out boards on which you cannot make a strong start. Second, a well-formed Sudoku game has one and only one solution. 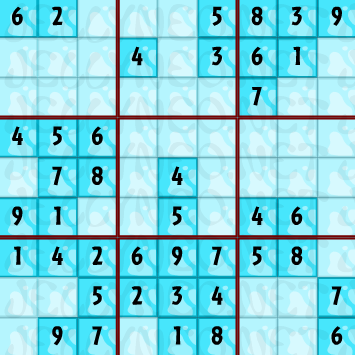 Because of the algorithm used to create Roodoku boards, there are often multiple possible solutions. As a result, it's often worth guessing when there are fewer than ten squares remaining but no obvious next move. It the puzzle is one with more than one possible solution, you won't be able to solve it without making at least one guess. Fortunately, in this case, more than one possible guess will lead to a solution.